Rockford Road Runners were organized as a running club on September 17, 1968. The prime objectives of the organization has been the promotion and encouragement of running and walking and the education of the public as to their benefits. In furtherance of this objective RRR has sponsored or conducted races, educational activities, social events, published newsletters, maintained websites, members race Circuits, presented recognition awards and do all such other things as may be conducive to the encouragement of running and walking. The Rockford Road Runners club is an ongoing member club of the Road Runners Club of America. Rockford Wildcats - In August of 1997 the Rockford Road Runnners started their youth running group the Rockford Wildcats. The youth group is a youth running program which is designed to let kids have fun while learning about running. The ages of the runners range from 5-18. The program is open to all who might be interested in running, and competes in a series of cross-country meets during the fall, as well as local road races. The group also holds a number of events throughout the year including the RRR annual Wildcat Youth Cross Country meet as well as a free cross country meet held for area middle schools. The group is coached by volunteer adult runners, many of which are Rockford Road Runner members. As an RRR standing committee the Wildcats continue to serve not only the running community but our community as a whole by providing a free youth program. Children need just two things to participate a pair of running shoes and a desire to run. 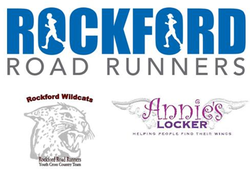 Annie's Locker became a part of the Rockford Road Runners as a standing committee in 2009, originally founded by and RRR member in 2008, it was inspired by a fellow runner who died in 2007, the idea was born to do something to inspire people toward a healthier lifestyle. The committee's mission continues to inspire and promote a healthy lifestyle as Annie's Locker collects and distributes new and gently used fitness gear to people in need and provide race scholarships in addition to other projects that have included, a workout center for the Rockford Rescue Mission Women's Recovery Program, 500 pairs of new shoes for District 205 public schools, and much more.The ongoing projects of this committee continue to serve both the running community and inspire many throughout the community to improve their health and lives and along the way...."help people to find their wings!"